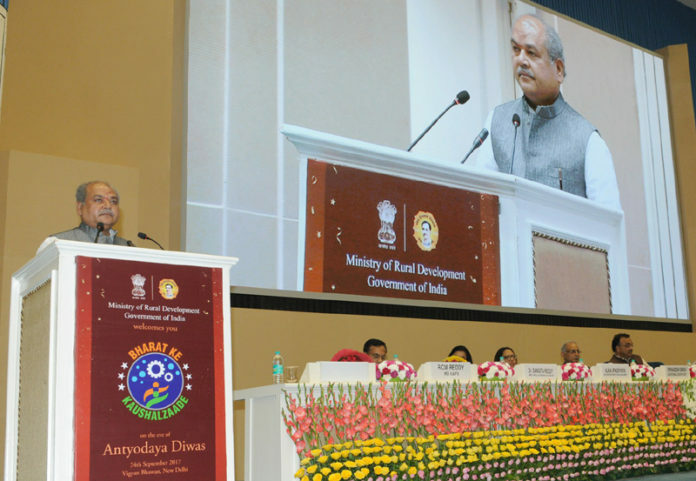 The Union Minister for Rural Development, Panchayati Raj and Mines, Shri Narendra Singh Tomar addressing at the celebrations of Bharat ke Kaushalzaade, on the eve of Antyodaya Diwas, in New Delhi on September 24, 2017. New Delhi: Rural Skills Division, Ministry of Rural Development has organized ‘Bharat ke Kaushalzaade’, an event honouring beneficiaries of its key skilling programmes, on the eve of Antyodaya Diwas 2017. Staying true to the spirit of Antyodaya Mission, which lies in ‘reaching out to the last person, the event, was graced by almost 800 plus candidates and alumni to celebrate and honour beneficiaries from both of MoRD’s flagship skill development programmes i.e. Deen Dayal Upadhyaya Grameen Kaushalya Yojana (DDU-GKY) and Rural Self Employment Training Institutes (RSETI). The event was significant as it was on this day 3 years ago that the Ministry of Rural Development announced DDU-GKY with a focus on building capacity of rural youth to address the needs of domestic and global skills requirements. Additionally, MoRD has re-energized RSETI through alignment with Common Norms for skills development schemes. And through sustained efforts and focus on both programmes, the Ministry has successfully skilled 5.05 lakh rural candidates under DDU-GKY and has also been conducting skilling for self-employment through RSETI with a total of 14.09 lakhs candidate skilled and 9.70 lakhs candidates settled till date. DDU-GKY not only offers industry relevant skill training to candidates, it also works closely with industry and leading corporates to strengthen the post-training employment scenario for its trainees. A result of this is sustained and fruitful corporate linkages pan-India, with leading names like Pizza Hut, KFC, OCIFIT, Safe Express, Matrix to name a few, whose employees i.e. DDU-GKY alumni participated at the event. 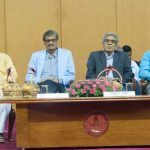 Speaking on the occasion, the Chief Guest, Minister of Rural Development, Panchayati Raj and Mines, Shri Narendra Singh Tomar said that, if India had adopted the skilling mission soon after it got independence, the problem of unemployment would not have achieved such a dimension as it is today. 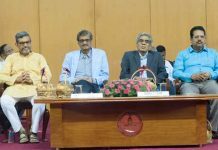 But, he lauded the vision of the Prime Minister Shri Narendra Modi to create a new Ministry of Skill Development after it came to power in 2014 and expressed the hope that in coming years more and more youth will be provided training for gainful employment through various skilling missions. He also exhorted the youth present on the occasion to encourage and make aware the rural youth and fellow friends to register on Kaushal Panjee launched at the event from 1st to 15th of October, 2017 for getting quality training and jobs. In his address, the Minister of State for Rural Development Shri Ram Kripal Yadav said that it is a matter of great pride that after getting training through RSETIs and DDU-GKY, the youth are getting monthly income of Rs. 10,000 to Rs. 30,000. He said that quality training imparted at these institutes will make them stand not only at Indian job market, but they can also make a mark in foreign countries. The event also witnessed the mobilization platform launch, branded ‘Kaushal Panjee’ (Skill Register). It aims to be citizen centric end-to-end solution to aid mobilization of candidates for RSETIs and DDU-GKY. It facilitates mobilization of candidates through Self Help Group members, Gram Panchayat Functionaries, Block Officials, CSCs and directly by the candidate. RSETIs and DDU-GKY Partners can access the Kaushal Panjee to connect with the mobilized rural youth. Kaushal Panjee is connected to the Social Economic Caste Census (SECC 2011) which will help the States plan and target their mobilizations based on the socio-economic profile of households in their State. Another highlight of the event is the re-branding exercise undertaken by MoRD for Rural Self Employment Training Institutes, wherein a new logo for RSETI was unveiled. The logo, depicting ‘reaching for the stars’ aims to portray the RSETI beneficiaries and their achievements.